This Marmot Force 2p Tent Review is about the 2017 version of the famous backpacking tent. This is an ultra-lightweight freestanding 3-season quality tent. 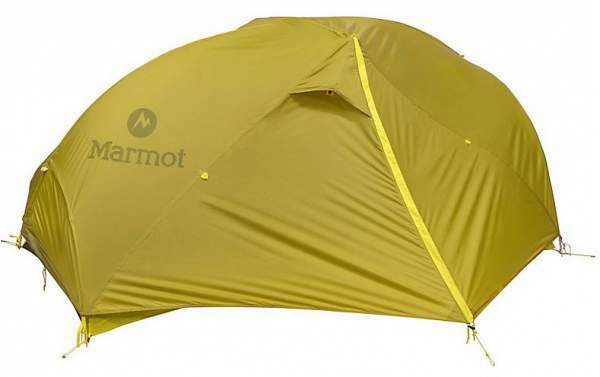 Marmot Force 2p Tent: 2 Person 3 Season. ♦ The Marmot Force 2p Tent is a 3-season tool, and as such, it is built as a double layer structure with the inner tent and the fly. The upper body of the inner tent is completely the No-See-Um Mesh, so this is a structure which does not keep the warmth and this is one of the reasons why it is not a winter tent. ♦ The tent is also fully freestanding, but as usual, this applies to the inner tent only. To have a fully functional fly, it is necessary to stake it to the ground. But indeed, you can manage without it if the terrain is such that staking it is not possible. Here is the tent shown with the fly and with the closed vestibule. This is the main bigger vestibule. The weight of the Marmot Force 2 tent is only 3 lb 8 oz (1585 g). This makes it a great tool for backpackers. If so, then it is great also for a variety of other outdoor activities like hiking, climbing, mountaineering, biking, kayaking, and you name it. But it is fair to say that this is not the lightest option on the market. To realize this, it is best that you check my another text with a long list of such ultra lightweight tools. Though, in the specifications below, you will see also the minimum weight which is only 2 lb 12.5 oz (1260 g). About this terminology please see more in this text. Sizewise, with its dimensions 86 x 52/41 x 41 inches (218 x 132/104 x 104 cm), this tent is formally declared as a 2-person tent. But you could use it that way only with somebody who is very intimate to you; this is a very narrow tent for two people and you can put only 20 inches pads inside. But the truth is that you have two vestibules and two doors, so you have a lot of space for gear and two people can indeed manage with such a tent. The packed size is 18 x 6.7 inches (45.7 x 17 cm), so it can be transported in various ways, either on/in a backpack or on a bicycle, in a kayak, on a motorbike, etc. The old model weight was 2 lb 14.5 oz (1320 g); the new model is heavier, 3 lb 8 oz (1585 g). The old model vestibules areas are 7.9 + 3.8 sq ft (0.73 + 0.35 sq m); in the new model you have 6.9 + 5.2 sq ft (0.64 + 0.48 m²). The vestibule area is bigger now. The old model tent floor area is 28 sq ft (2.6 sq m); in the new model you have 29 sq ft (2.7 sq m). The old tent dimensions are 85 x 50 x 38 in (214 x 127 x 97 cm); the new is 86 x 52/41 x 41 in (218 x 132/104 x 104 cm). So it is higher and bigger now. The old tent floor fabric was 20D; now it is more durable 40D. Poles are different. The former version did not have the loop pole in the feet zone. 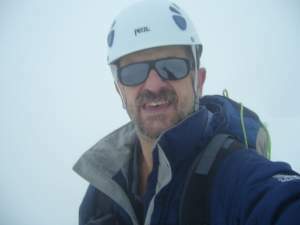 The old version was known under the name Marmot Force UL 2P. You have the best of the best here. Note, there is a confusion in various sites about numbers and materials. The data given here are from the Marmot’s site. There are 4 poles in total. Two of them create loops in the head and in the feet section. One ridge pole connects these two poles, in fact, they are permanently connected to each other. There is one extra transverse brow pole which pulls the side walls up and makes the doors and the side walls almost completely vertical. All poles are shock-corded, no chance to lose any piece of them. The material is aluminum and the poles are DAC NFL, with 9.3 mm and 8.7 mm diameter. The DAC is the leading manufacturer of tent poles, and NFL is the type they developed for ultra-lightweight backpacking tents. Canopy fabric is 15D No-See-Um mesh F/R; this symbol means fire-retardant. Floor fabric is 40D 100% nylon, W/R, F/R. Fly fabric is 30D 100% nylon ripstop, silicon PU, W/R, F/R. This is a full-coverage fly with a vent on the bigger vestibule. So you realize that this fabric is reasonably durable for a tent built with the intention to be an ultra lightweight tool. You have 2000 mm rating for the floor, and 1800 mm for the fly. So these are great numbers, and with all seams taped you will be completely protected from elements. You have them 2, the doors are the same size but the vestibules are asymmetric. They create 6.9 + 5.2 sq ft (0.64 + 0.48 m²) of protected space for gear. All is color-coded, so it is very easy to set this tent up. You need this coding because of the asymmetric vestibules design. The inner tent attaches to the poles (which are freestanding even without the tent attached to them) through clips. The tent floor is not completely rectangular, so at the head section you have 52 inches, and only 41 at the feet area. There are two mesh pockets, one for each user, and you also have one lampshade pocket at the top. The fabric is reinforced at the places of the highest tension, like in the corners. So clearly, you have a lot of attention to details in this great tent. Min weight: 2 lb 12.5 oz (1260 g). Max weight: 3 lb 8 oz (1585 g). Dimensions (L x W x H): 86 x 52/41 x 41 in (218 x 132/104 x 104 cm). Floor area: 29 sq ft (2.7 sq m). Vestibule area: 6.9 + 5.2 sq ft (0.64 + 0.48 m²). Packed size: 18 x 6.7 in (45.7 x 17 cm). See how the Force 2 compares with these two top models, both from 2017. Note that the Big Agnes tent is currently without a match regarding the weight. In the conclusion of this Marmot Force 2p Tent Review to stress again that this is a very technical tent, high quality and expensive, and not for everybody’s pocket. The tent is an improved version of the previous 2015 model; it is a bit heavier but it is more durable now. The tent can be used by two people, or as a solo tool, it is definitely light enough for such a purpose. I can fully recommend it if you can afford it. This tent is included in my list of best lightweight 2 person backpacking tents. If this tent is not what you are looking for, please check my page with tents and shelters, there are many great models described in detail, for everybody’s pockets, and for every purpose. You might want to check this luxurious Big Agnes Copper Hotel HV UL2 Tent and also this Exped Mira II HL Tent which is in a similar style as the Force 2p tent. If you have questions or comments, please use the comment box below. I wish you a nice day.